Regardless of whether you refer to it as a Managed Server, or a Managed Server Hosting Plan, the results are the same. A Managed Server is a form of Internet hosting which allows a single client or customer to lease an entire server that is not shared with anyone else, or any other website and is provided with complete management support from us. Managed Server Hosting provides a much more flexible hosting option when compared with shared, resell or even vps solutions because it gives you complete control over your own server, which includes a variety of characteristics including your choice of an operating system, hardware, security, options and so on. Check Out Our Preconfigured Servers Below Or Click Here To Request A Custom Quote - We will build your server the way you want it. FREE Operating System Installations Include: CentOS, Debian, Fedora, FreeBSD, or your favorite open source linux distro. Additional discounts are available for multiple server purchases, resellers, and yearly contracts. Contact us for more details. RAM and hardware upgrades are always available and vary with the market. Contact us for current pricing details. 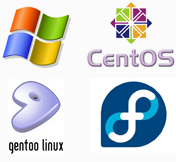 Here at DrivenHost you can choose from multiple popular operating systems including CentOS, Ubuntu, Debian, Fedora Core, Suse, and FreeBSD. Installation of operating system is included free! cPanel is the #1 used control panel in the world. If it was not the best we wouldn't be using it. DrivenHost clients will have the option of choosing from two web management softwares. Either cPanel / WHM or DirectAdmin. The software will be included at no extra charge with the order of any of our servers. Our support team is here to help you. Available 24/7 dedicated in providing the best possible service in the industry. We now provide our server clients with a free domain reseller account. You will be able to sell domain names at a discounted price to your customers with many flexible features such as billing system automation, all in one management area and many others.